Left Montlivault along the D72 to Blois, then along the Loire on the D173 to Chaumont for a visit to the château, kind of stark as they go. Leaving the valley, then over some rolling country on the D27, D30, along the Masse, and D80 through the Forêt d'Amboise to Chenonceaux on the Cher. 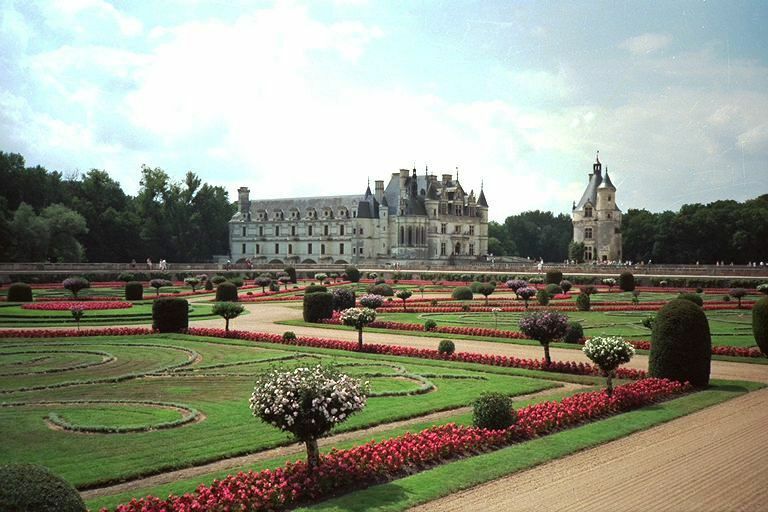 Here you will find one of the most beautiful châteaux astride the river, with formal gardens all around. My first flat in France was near Souvigny-de-Touraine on the D30. The consequences of this flat, and my colossal ignorance, would be with me for the rest of the trip. It was Sunday and of course that meant all the French bikers were out for their weekly tour. You can always count on seeing plenty of bikers in France on Sundays. There are no bells or whistles when they pass you, only heavy, rapid breathing behind you as they kick it to pass. So, I received lots of offers of help, but got a new tube put in pretty quickly and pumped it up as best I could with my cheap Zefal, about 80 pounds. From Chenonceaux the route follows the Cher to Vierzon. I stayed on the south bank with the D17 as far as St. Aignan, then crossed to the north side and rode the D54 to Villefranche-sur-Cher, crossed back and got the D51 into Vierzon. It was on the way into town when a man said to me "Les Américaine ... tout les jour le bon equipage." Well, my Cannondale front panniers and handlebar bag were new, but my bike was 8 years old. The hostel here is right downtown, but little used.